DUP leader Arlene Foster with Defence Secretary and Conservative MP Gavin Williamson at the Killyhevlin Hotel in Enniskillen on Friday. Picture by John McVitty. The senior Tory attended Friday’s dinner at the Killyhevlin Hotel in Enniskillen, the press were not informed of his visit and details of his speech at the DUP gathering were not made public. On Friday morning the MP for South Staffordshire tweeted details of a meeting with the Chelsea Pensioners alongside pictures of him having breakfast with the army veterans. However, he made no mention of his planned visit later that day to Northern Ireland or attendance at the DUP dinner. It was later claimed that details of his visit were not made public for “security reasons”. 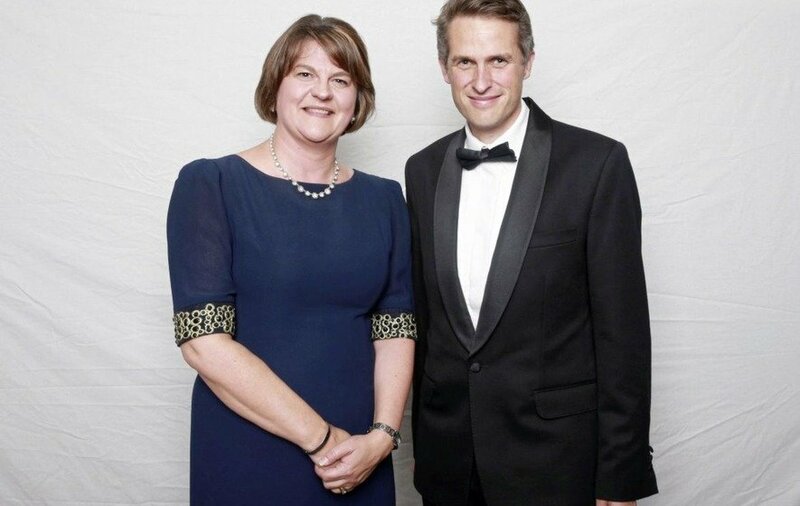 Mrs Foster tweeted on Saturday that she was “Delighted to host the Secretary of State for Defence in Enniskillen last night at my annual dinner”. Mr Williamson is the latest high profile member of the Tory party to attend a DUP dinner. In February Conservative MP Priti Patel attended a sponsored DUP constituency dinner at the Galgorm Hotel in Ballymena, where Ian Paisley interviewed her on stage about Brexit. Last September Environment Minister, Michael Gove, gave a talk on farming at a dinner hosted again by Ian Paisley at the Tullyglass hotel in Ballymena. At the time the DUP described it as “an annual MP’s constituency dinner”and denied that it was a party fundraiser. Meanwhile, Sinn Féin deputy leader Michelle O’Neill, writing in today’s Irish News, says that the decision by Karen Bradley to reduce MLA wages should not be “allowed to mask the true nature of the undemocratic and politically damaging measures” also announced by the Secretary of State to Parliament on Thursday. “Despite championing rights and equality in her own constituency and country, she failed to do so on behalf of citizens here”, Ms O’Neill said. “Instead what she announced was a suite of measures which subvert the democratic process and previous agreements. “Faced with the prospect of a court-ordered Assembly poll, she moved to suspend her powers to call an election as set out in the legislation. That is a hugely retrograde step and a move away from the Good Friday Agreement. “It also begs the question, what kind of self-declared democratic government, suspends the right of the people to have their say at the polls?”, she added. With many thanks to: The Irish News for the original story.